Reading is a favorite pastime of Rand’s and mine, and something essential for safety as much as enjoyment for sailors. When the sails are trimmed and the routine maintenance of the day is done, it’s a delight to have a good book to sink into. But what to read? 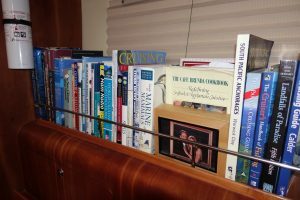 Here we share our sailing library with you, including essential books on boats, weather, navigation, cooking on board, and some of our favorite novels, travel books and non-fiction stories to read while sailing. Our selections are our favorites and those family, friends and fellow cruisers have shared. If you have any comments about the books on our list, or others you want to share, please post a comment. We’ll continually update this list. To find & purchase books for your library, Many of the books on our list also have hyperlinks to our affialite page on Amazon. For those of you not familiar with how affiliate marketing works, if you purchase an item after clicking the link, Amazon shares a small amount of the price back to the referrer. That comes out of Amazon’s profit; you pay the same. Even though the commission is tiny, we put it into our sailing kitty – so thank you! Fire, Sebastian Junger, contains a harrowing in-the-trenches profile of Ahmad Massoud, the Afghan guerrilla leader an ally of the West for nearly two decades, Massoud was assassinated two days before the terrorist attacks on the U.S. Junger was in Afghanistan last December.